Pool chemical dispensers, or automatic pool chlorinators, will use chlorine or bromine tablets/sticks to help sanitize your pool water (Source). They work by slowly and automatically dispersing chlorine and bromine into your pool so that the pool water remains free of bacteria and cloudlessly sparkles (Source). Most of the pool chemical dispensers will let you configure the rate at which the chemical will dissolve- enabling you to regulate how much chlorine or bromine you add to your pool at a time (Source). The Pentair In-Line Chlorine and Bromine Feeder is our top pick- It can hold 98 small or 11 large bromine or slow-dissolving trichlor tablets, and uses 1/4" feeder hoses and control fittings and valves. It can chemically treat 6,500 to 27,000 bottom feed gallons and 18,000 to 70,000 top feed gallons. And since it is a completely enclosed system there's no special venting that you will have to install. Merely installing it on the return line of downstream pump equipment. Users love it, with many applauding its design and ease of install- saying that now all they have to do is throw in some chlorine tablets once every few weeks and the pool doesn't turn green anymore. That said, let's take a look at five of the best pool chemical dispensers on the market today and see how they compare. This 5 lb., automatic Pentair Chlorine/Bromine feeder is a reliable automatic chlorinator that you can use on either your pool or your spa. Users like that the Pentair chlorine/bromine feeder is easy to install and the auto feeder works great. Only a few people said that they had problems with it leaking. The automatic feeder can hold 11 large or 98 small bromine tablets, which dissolve at a very slow rate, or trichlor tablets. It can treat 6,500 to 27,000 gallons bottom feed and 18,000 to 70,000 gallons top feed. It has an enclosed system so you will not have to worry about venting. There is an overwhelming amount of good feedback for the Rainbow 320 with some users talking about how they don’t have to worry about green water anymore. The users who were less impressed about the product seemed to have a problem with the durability- that it only lasted about a year before they started having problems with leaking. One customer talked about how they had a hard time with their previous feeder, saying they couldn’t get the chlorine level right. Even though the other feeder was automatic they weren’t able to adjust the flow but with the Pentair they were able to set it to where it was needed and hasn’t been a problem since. One buyer was worried they might need a cap wrench to get the lid off, but as long as you have a strong grip you should be ok, otherwise you might need to get a wrench. This automatic chlorine feeder is perfect if you are looking for something systematic. The 4.2 pound, automatic Hayward Inline Pool Chemical Cleaner is an effective chlorinator that uses both large and small, slow-dissolving tablets. Its users enjoy how easy it is to install but some have had problems with the o-ring. 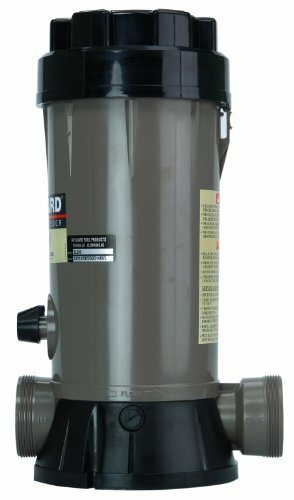 The Hayward CL200 chlorinator sanitizes pools from 5,000 to 40,000 gallons and is both durable and corrosion free. Others commented that the mounting base is removable, so if you plan on having it off the ground you won’t have to worry about the mounting base floating. More than a few users reported that you will be going through a lot of o-rings and one user said that he needed to get an o-ring tool. Many users bought the Hayward as a replacement and found it to be superior to their previous model. While a few customers said that they had a problem with the lid sticking due to suction, most say that they have not had a problem with it and were very happy with the product. It was also recommended to have shut off valves on both sides if you are using the chlorinator on an above ground pool. One user replaced his old chlorinator because it leaked. He has had the Hayward HL200 for three seasons and hasn’t had a problem. 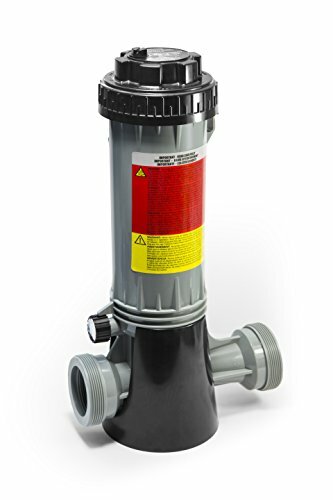 This is an efficient inline pool chlorinator and is a great product if you are looking for easy installation on new or existing equipment, especially if it uses PVC pipe. 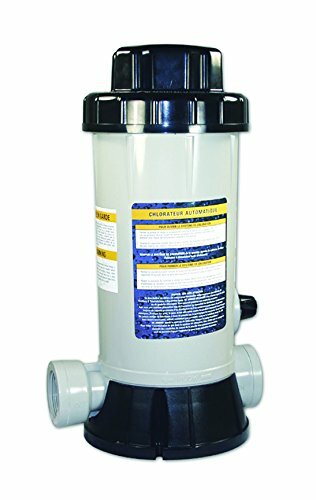 The 3 pound, automatic Hydro 8750 Super Premium Inline Chlorine Feeder is a good chlorinator for both in-ground and above ground pools that can take both chlorine sticks or one to three-inch tablets. Users really like the fact that it is an automatic chlorinator and is easy to install but some had problems with connection leaks. There was one user that suggested putting shut off valves on both sides of the product. The Hydro 8750 is fully adjustable so depending on the size of your pool and how much chlorine it takes, you can adjust how fast the tablets dissolve. The unit is made of heavy-duty resin and comes with the fittings for a 1-½ inch plumbing. More than a few customers seemed to have a problem with the O-ring that caused the lid not to seal right and created a leaking problem until it was replaced. One buyer mentioned that they were able to let it go for two weeks before having to replace the tablets while another said they got a solid week before having to replace the tablets. The majority of customers loved the Hydro 8750 chlorine feeder- they were able to just set it and forget it without having to deal with it constantly. One of the best features users like is being able to control the dispenser depending on the size of their pool and deciding how much chlorine they should use, which helps the tabs last longer. 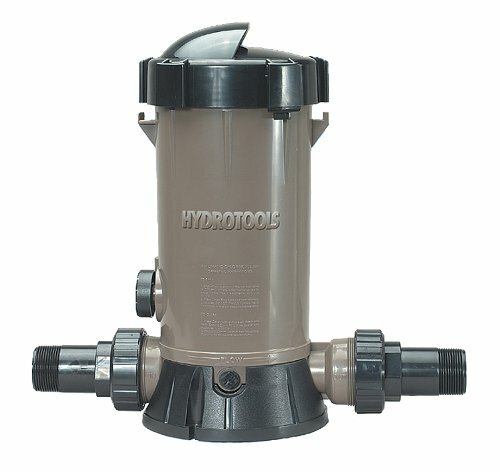 This Automatic Hydro 8750 Chlorinator is a safe choice if you are looking to keep your pool chlorinated without having to constantly check in on it. This 5.3 lb, Automatic Aquatix Pro Chlorine Dispenser is a practical option with an easy lock cover that has thread assist to make sure you get a secure seal. Users agree and love how easy it is to maintain and make any adjustment to the regulating valve to work with their pool. Many have mentioned that you should measure before buying to make sure it will fit the area you are placing it in. The Aquatix can hold up to 20, 200g bromine tabs and you can adjust the regulator to what your pool needs so that you will get the most out of the tabs. Some users commented on how solid the quality of the product is and how it isn’t just made of cheap plastic. The Chlorine Dispenser is also corrosion-proof which will help with longevity. The cap is childproof so you don’t have to worry that youngsters might drink or place something in the dispenser. The overall consensus is the Aquatix is easy to install and does a good job at keeping the pool clean. One buyer commented that they had a floating chlorine dispenser and that it wasn’t good enough, given the high pollen content in the area and needed something stronger. They bought the Aquatix Pro and said they check it once a week to make sure it is full of tabs and let it do its job. They no longer have a problem with a cloudy pool. This economical chlorine dispenser is a solid option if you are looking for more bang for your buck. This 3 lb., Automatic Inline Hydro Tool pool chemical feeder is an inadequate above ground pool chlorine dispenser that is equipped with a control knob to let you adjust the filtration settings. It’s user hate how poor the quality of the product is, with a lot of them saying how there is a leak near the adjustment knob. Other buyers complain that it broke after just a month and one mentions that the adjustment knob broke off. Though few users mention a problem with the cap being tight and hard to remove the majority complain about a terrible leaking problem. Not to mention that multiple users that reported the issue, got a replacement and the second one either had the same problem or it leaked from a different area. One of the buyers that liked it mentioned that if you bought it you should keep it above water level or you will have to place a shut-off valve on the high water side/s. Another user that didn’t seem to have too many problems with it said that the pipe threads were a little loose and they needed to be fixed with Teflon tape but outside of that didn’t really seem to have a problem. They also mentioned that when taking care of it for winter you need to drain it and make sure the plug stays out, since it is plastic the ice could crack it. This automatic chlorine dispenser is a poor choice if you are looking for a reliable product that will last. Outdoor swimming pools are a lot of fun in the summer months, providing an excellent means of cardiovascular aquatic exercise, and also a great communal gathering space for family and friends to enjoy a swim. 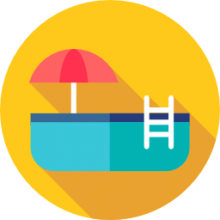 While pools look great, they do require periodic and regular maintenance- if you do not keep the pool clean up to chemical standards it can become a disgusting and uninviting place for you and your family to swim. Pool maintenance can take a lot of time and essentially entails you ensuring that the pool water remains free and clear of algae, bacteria and other types of toxic contaminants. Without chemical maintenance, your pool can become clogged with bacteria that makes it look disgusting and poses infection and disease risk for swimmers. Filling your pool with the right amounts of pool chemicals is the best way to keep your pool clean and healthy. Chlorine is the number one chemical that is most commonly used to kill bacteria and sanitize your pool water. While chlorine and bromine chemicals can keep your cool clean, it can be a bit of a hassle to remember to add them to your pool- that's why automatic pool chemical feeders are such a great option to dispense these chemicals automatically. As well, it can be difficult to remember how much to add at a time- pool chlorinators like the ones we have reviewed above work automatically, dispensing the bromine or chlorine chemicals as needed into the pool So you don't have to fret about remembering or assessing how much pool chemical needs to be added to your backyard swimming pool. Another added benefit is that most pool chlorinators and pool chemical dispensers will universally work with all of the different types of pool filtration systems on the market today. Indeed, as we have reviewed user feedback for these pool chemical dispensers, most users are happy that pool maintenance work can now be done automatically. They can just throw in a couple of chlorine tablets once every couple of weeks and the automatic pool chemical dispensers will do the work for them, keeping their pools clear, unclouded and free of harmful bacteria. That said, some users to have to put in some extra work installing these devices depending on their particular set up- so it's not always so plug-and-play. There will have to be some thoughtful installation done, in some cases, depending on your filtration system and generally how your pool is set up and configured.